"Klein Tools is thrilled to partner with a great organization like Operation Homefront," said Mat Klein III, Chairman of Klein Tools. "So many of our customers and their loved ones are current or retired military members, and it is an honor to give them our support." "Our mission is to support service members and their families in need of immediate help," said Amy Palmer, Chief Development Officer for Operation Homefront. "Klein Tools' generous contribution will play an integral part in fulfilling those pressing needs." 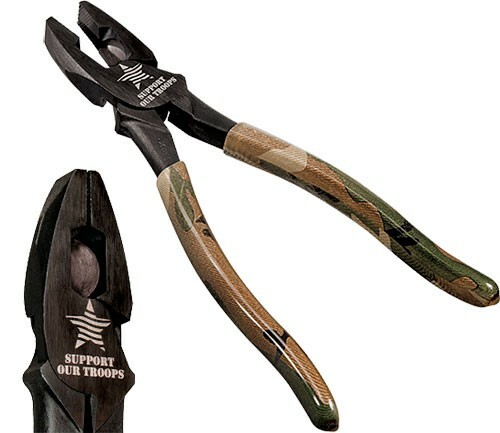 The pliers feature a plastic dipped handle with a camouflaged design and a sleek black-oxide plier head with a special laser-etched "Support Our Troops" logo. These are fully functional pliers that are made in the USA at Klein's new plant in Mansfield, Texas. You can support a company that supports our troops by picking up a pair of these limited edition pliers.